Wow. I cannot not stop talking about this Buffalo chicken soup. It is my favorite soup. Perfect for the cool weather. It’s like eating (my favorite) buffalo chicken wings, with celery and onion, and cheesy. Good, gooey, melted cheese. I used some leftover fire-eater roasted chicken breast in this soup. The chicken has a nice kick to it, so the soup had a nice little kick to it too. If you use a pre-cooked chicken without any spice to it, you might want to add a bit of cayenne or hot sauce to the soup. 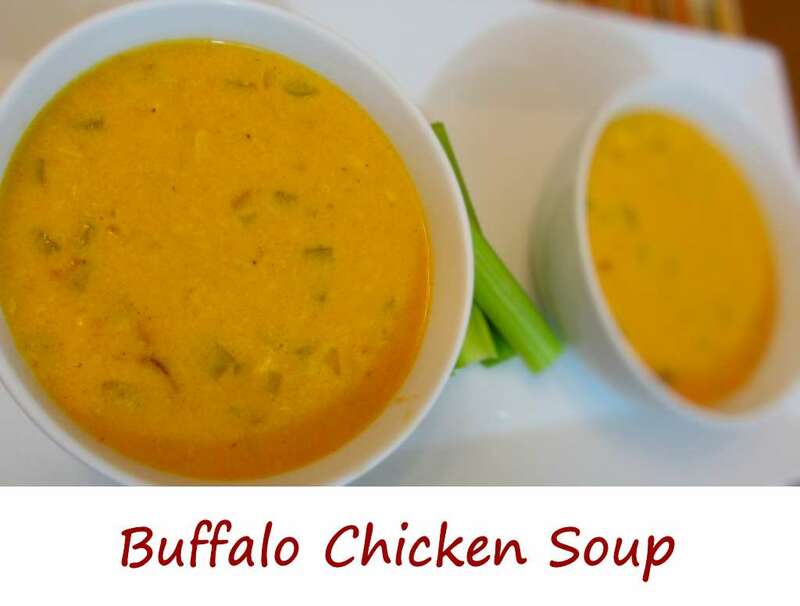 Buffalo chicken soup is even better the second day, if it lasts that long. Best served with my Buffalo chicken grilled cheese sandwiches. Note: I used leftover fire-eater chicken that has a nice kick to it. If you are using rotisserie or other 'tame' chicken you might want to add some hot sauce or cayenne to the soup for a little kick. Once melted, add the celery and onion and cook until both are tender. Stir in the flour and cook 2 minutes, stirring constantly. Stir in the half-and-half and water. Add the bouillon and stir to dissolve. Add the chicken and wing sauce. Simmer 10-15 minutes, stirring occasionally. I’m not sure when this idea hit me. I was probably sleeping, dreaming away… In my dream I dreamed of buffalo wings. A big batch of tasty, hot buffalo wings. And then, I started dreaming of ABTs (bacon-wrapped stuffed jalapenos)… tasty, cheesy… with just a little heat. Then POW! I woke up and thought Buffalo ABTs (also known as atomic buffalo turds)! And they were really, really good. So good I made Buffalo ABTs several times in one week. Jalapenos lose a lot of their heat when slow cooked for an hour or two. They still have a little bite, but are more like a poblano than a hot pepper. The stuffing for the ABTs is fantastic, and also makes for a great dip for celery or chips. You can also chop up the entire ABT (jalapeno and all) and use in a grilled cheese sandwich. Also tty my Hawaiian ABTs. Preheat your grill to 250 F for indirect cooking. Combine the cheese, wing sauce, celery and blue cheese. Add more sauce, celery or blue cheese as desired. Spoon cheese mixture into jalapeno halves. Wrap each jalapeno half with a piece of bacon. Brush bacon with more wing sauce. Cook over indirect heat for 1 1/2 hours - 2 hours until the jalapenos have softened, the bacon is done (but not really crispy), and the cheese is nice and bubbly.